Taipei City. 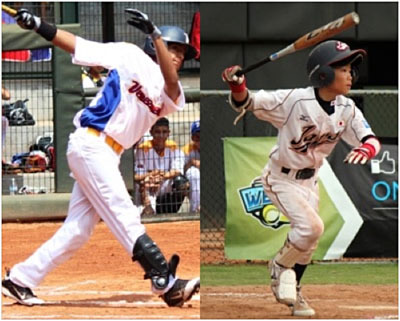 The first round at the II 12U Baseball World Cup in Taipei City concluded on Thursday. Eight teams qualified for the final round, which will commence on Friday with the quarterfinals. Japan faces Panama, Venezuela squares off with Mexico, Chinese Taipei plays against Korea and the United States take on Brazil. On the last day of first-round play on Thursday six games were scheduled. In the morning Brazil nearly got upset by the Philippines, needing extra innings to prevail and securing third place in Pool A. Also Japan needed a walk-off single to win against Mexico, keeping their record clean. Venezuela did the same with a victory over Panama. The United States closed out the preliminary phase with a blowout against Korea. Russia celebrated its second win over Hong Kong, Chinese Taipei its fifth against Italy. At the 12U Baseball World Cup young athletes come together from all around the world to celebrate goodwill, fair play and cultural diversity. The tournament forms a part of a long-term plan to focus on youth and keep the sport relevant, modern and aligned with the values of the Olympic Games and international spirit.